Klaus puts on his finest for the ball. 3x14. Klaus puts on his finest for the ball. 3x14. Wallpaper and background images in the Maonyesho ya Televisheni ya Vampire Diaries club tagged: the vampire diaries season 3 3x14 klaus. This Maonyesho ya Televisheni ya Vampire Diaries photo contains suti biashara, biashara suti, nyayo, suti ya nguo, seti, seti ya nguo, single breasted suti, and seti moja ya matiti. 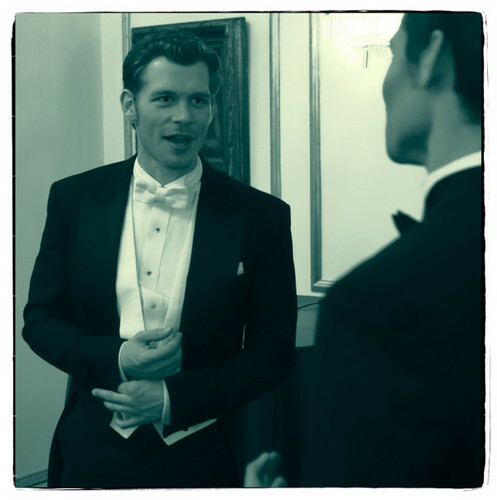 Yes it is Klaus with Elijah and it's a Twitpic from Twitter by Joseph Morgan.